Apple has placed an order to Samsung Display for 60 million OLED panels for this year's iPhone 8, in addition to the 100 million units reportedly ordered by Apple last April. If the numbers are accurate, today's news confirms the display maker as Apple's main source of OLED screens for the next-generation iPhone (via The Korea Herald). According to those familiar with the display market, Samsung will officially supply around 80 percent of the display panels in the iPhone 8. The company still didn't confirm the Apple-related OLED news, with a Samsung spokesperson saying "we can’t officially comment on anything related to the order." "Samsung takes pride in small OLED panels," said an industrial source familiar with the matter. "While LG is enhancing its OLED business for TVs, Samsung is likely to focus on mobile OLED panels this year, helped by the Apple orders." The iPhone 8 is expected to include an OLED screen as a way for Apple to make the device thinner and include an edge-to-edge design with various features -- like Touch ID -- integrated directly into the screen. 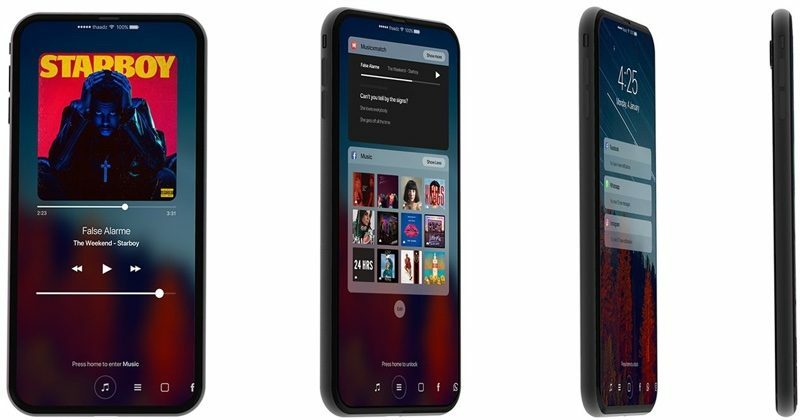 Apple is believed to launch three total new iPhones this year, two of which will be basic updates to the iPhone 7, referred to as the "iPhone 7s" and "iPhone 7s Plus," while the third "iPhone 8" will include the OLED display and more drastic design changes. The scale at which Apple operates is astounding. Kudos to Samsung for truly being the innovator that forces all others to step up their game. Where would mobile display tech be if it wasn't for Samsung pushing the tech to the edges? Apple will most likely offer OLED panels on the "premium" version of the iPhone. And then market it that way while charging a ridiculous price for it. Meanwhile Samsung has OLED panels on their cheaper phones as well as their flagships. Can you imagine Apple dropping the ball in any one small area for a particular iPhone? If the puzzle pieces don't fall into place just right. If there is a component that isn't able to be manufactured at scale? Or an faulty part that either requires a full recall (a la note7) or occurs so late that the entire phone needs to be delayed 4-6 months? There are so many parts it's just crazy. You say that like Apple hasn't been using Sammy displays for years. Yes, they have been using Samsung displays. But it isn't the company that makes it burn in, it's the technology of OLED. I remember watching a documentary (if you can call it that) about the production of the newest Ford Mustang, and how something as tiny as a 1mm bolt could completely hault the entire factory's production if they didn't have it stocked. Keeping track of making sure all of the thousands of parts and needed things must be incredibly complex. And their production numbers are no where near Apple's level of scale. Insane. It was called Faster Horse I believe for those interested. This is my exact line of work, I work for Bentley Motors in the U.K. and ensure parts are kept in stock and that the system matches the stock levels we have throughout the factory. I'm responsible for 2,000 individual parts, some bespoke, it costs the company $20,000 per minute that the production line stops. We only build 60 cars per day, so I cannot even imagine how many iPhones are produced each and every day, especially leading up to a new release. He's saying that because burn-in is an OLED issue, not an LCD issue, & this will be the 1st OLED screen on an iPhone; to be clear- it wasn't a claim that Samsung has never manufactured screens for Apple before. All names are speculative. Some sites are calling it the iPhone X. As weird as it would be for Apple not to release an "s" phone as they have every other year since the beginning of time (or 2009), it would also be bizarre to release a "iPhone 7s" that looks so different from the iPhone 7. Either way, someone's world is going to be rocked in the fall.